But while food manufacturers have never been as spoilt for choice as today in terms of having access to powerful product inspection technologies such as metal detectors and X-Ray inspection systems, there is often a disconnect between what the technologies can deliver and the actual results, according to Larry Swift, co-owner and vice-president of Oakville, Ont.-based product inspection and hygiene systems distributor Shawpak Systems Ltd.
A box of Made Good granola bars, produced by Shawpak System’s long-time client Riverside Natural Foods, gets a thorough once-over from the METTLER-TOLEDO CI-Vision brand machine vision system to verify all the critical product and coding information printed on the package. 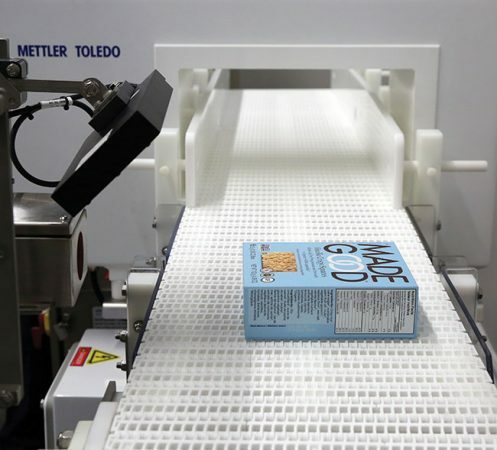 “We have found that many operators in the food business don’t fully understand product inspection technology,” says Swift, whose company is the exclusive Canadian agent for METTLER TOLEDO Product Inspection, the world’s leading manufacturer of metal detection, X-Ray inspection and vision technologies for the global food industries. “Typically a plant engineer would purchase the inspection system, sign off on it, and move on to the next project—leaving people on the production floor to work with it,” says Swift, who has built up a vast knowledge of the subject during his 20-plus years of experience in product inspection systems manufacturing and integration. “They may receive about two to four hours to learn it all when a technician starts it up after installation,” Swift says, “but that is typically all they get. To address this knowledge deficit head on, Shawpak Systems has just launched a new series of training programs conducted at the company’s newly-built Centre of Excellence training and demonstration facility in Oakville, offering hands-on training and expert classroom instruction to plant personnel and other end-users of product inspection and hygiene systems. 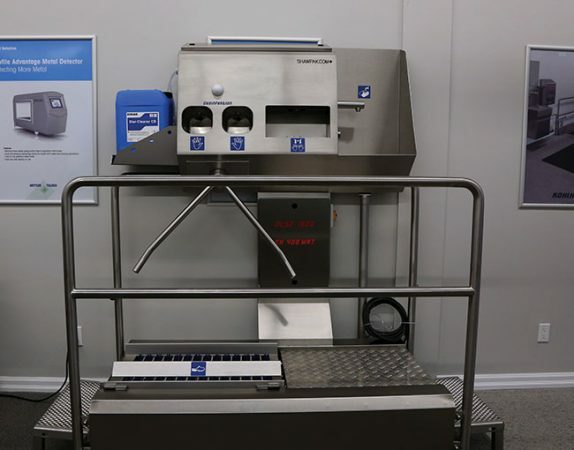 Shawpak Systems is the exclusive North American distributor for the full range of state-of-the-art Kohlhoff hygiene systems manufactured in Germany by Kohlhoff Hygienetechnik GmbH & Co. KG, including this comprehensive DesinFektion model installed at the Centre of Excellence. “We are very passionate about training here at Shawpak,” Swift told Canadian Packaging on a recent visit to the 2,200-square-foot facility equipped with a comprehensive range of advanced METTLER TOLEDO product inspection systems and automatic hygiene equipment ready to perform a broad range of tests and process simulations encountered by front-line plant personnel on daily basis. “We teach Product Inspection 101, which includes metal-detection, X-Ray, checkweighing and vision technologies,” says Swift, adding all courses are custom-tailored to address the visitors’ specific application requirements. Says Swift: “Educating clients on the fundamental principles of the product inspection equipment and processes is key for food producers to create and maintain a strong food safety program in their facilities. 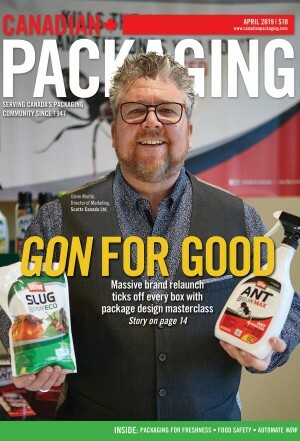 “Once they obtain that understanding, they will start to see a real change in performance and start realizing ROI (return-on-investment) almost immediately through less downtime and not having to experience the frustration of high false-rejects counts,” says Swift,” citing the company’s authoritative credentials as a certified trainer issued and validated by PMMI-The Association for Packaging and Processing Technologies. “Many people think that an X-Ray unit is a magic ‘Black Box’ that will detect anything and everything,” Swift relates, “but that’s just not the case. 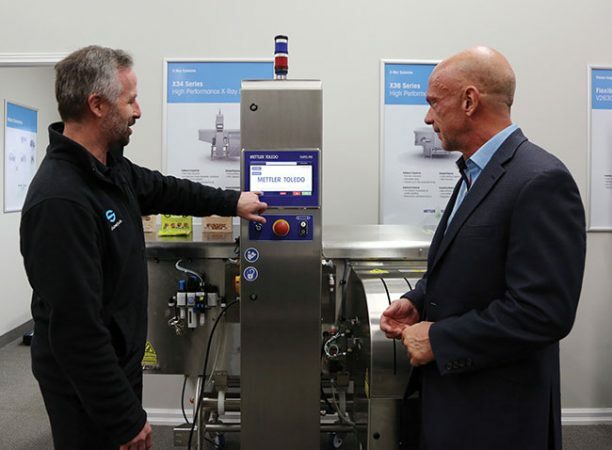 As Swift explains, the company’s Center of Excellence training and demo facility is designed to put the trained personnel at ease by removing them from the pressurecooker environment of busy production lines in order to absorb the acquired knowledge and information better. “Before we would typically go to customers’ plants to do the training,” he recalls, “but we often found that there is a problem with the attention span whenever you pull people away from their production line at their work—they just don’t absorb the training as well. According to Shawpak Systems’ principal trainer Brent Wilkins, a typical training session would last from four to five hours of instruction and product testing for groups of four to six people in a “more intimate and comfortable environment so that the people being trained so can absorb the information better. “We typically focus on maintenance and quality control personnel,” he says, “and we can customize and tailor a training course specifically to suit their requirements, whether they want to focus solely on X-Ray technology, or if they want to learn about all the different food safety standard levels and how they relate to product inspection… we can tailor to all that. “We find that once they understand that core knowledge of the technology,” says Wilkins, “they will be able to structure their quality control programs at their facility more effectively. This dynamic approach has certainly paid dividends with the Centre of Excellence facility’s first trainee. Shawpak Systems’ principal trainer Brent Wilkins (left) goes over a few points with Paul Canacas of Quadrant Engineering Plastic Products, the facility’s first trainee, over the display terminal of a running METTLER TOLEDO Safeline X-Ray product inspection system. Paul Canacas, global market segment manager for food and conveyance with Quadrant Engineering Plastic Products, as well as market segment manager for food and packaging with Quadrant Plastic Composites, says the training he received at the facility in late 2018 was “real eye-opener” for him and his company, which is currently developing a range of metal-detectable plastics that can be used to replace metal parts across a broad range of processing and packaging equipment used in the food industries. Nowadays operating as a wholly-owned subsidiary of the Mitsubishi Plastics business of Mitsubishi Chemical Corporation, Reading, Pa.-headquartered Quadrant group of companies is one of the world’s leading manufacturers of engineering plastics for a broad range of industries—from aerospace and automotive to industrial equipment and food and beverage. 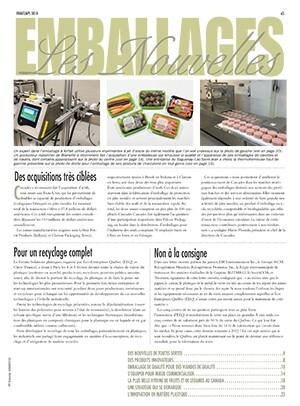 As Canacas explains, the emerging trend among food processing and packaging machinery manufacturers to incorporate more plastic component into the design of their equipment has created demand for a new range of metal-detectable plastics that can be detected in trace amounts by existing metal detection and X-Ray inspection technology. 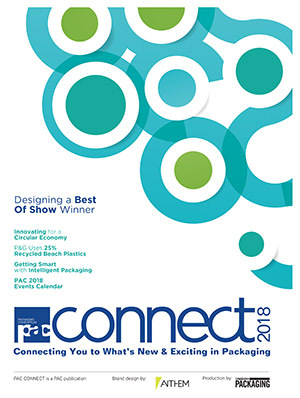 “We believe that detectable plastics are the future for global food safety, in terms of both total system performance and overall consumer protection,” says Canacas, citing fast-growing use of plastic equipment components in the food industry, including scrapers, conveyor guide rails, gears wheels, sprockets, grippers, paddles, former plates and other machine parts coming into direct contact with food product. 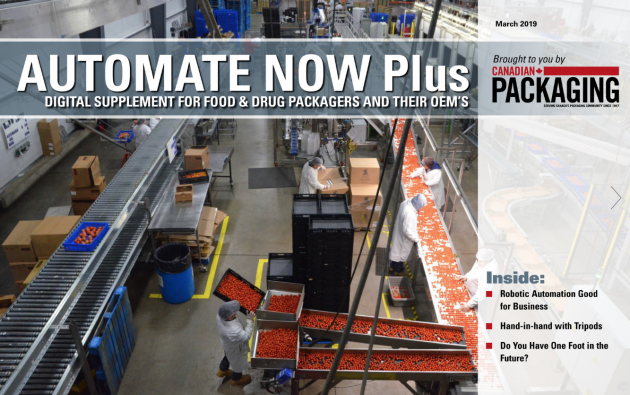 “Although it’s not mandatory right now, trends in industry regulations indicate a focus on addressing concerns that can be solved best with food-grade plastics for food handling and conveyance applications,” says Canacas, noting that Quadrant actually supplies METTLER TOLEDO with the plastic parts used in its metal detection systems. As Canacas relates, making plastics detectable by metal detectors and X-Ray systems is a “complex” scientific endeavour requiring highly precise application and dispersion of various specialty ferrous or nonferrous powdered additives in a perfectly measured and balanced way that “fully respects mechanical properties of the plastic material and the integrity of the machinery. 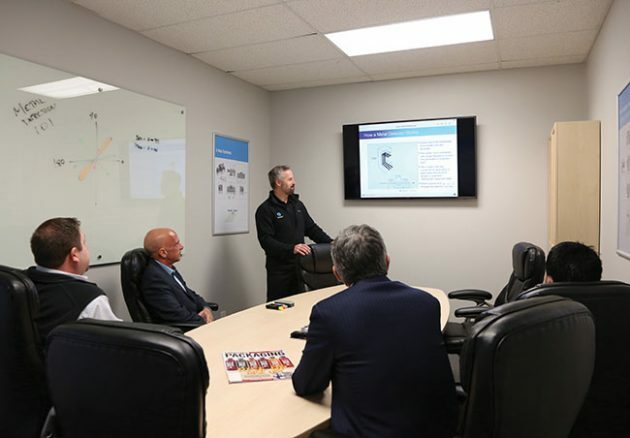 Brent Wilkins conducting a sample training session on metal detection fundamentals at the company’s on-site classroom, which can comfortably accommodate teams of four to six people for custom-tailored training sessions on product inspection and hygiene technologies. 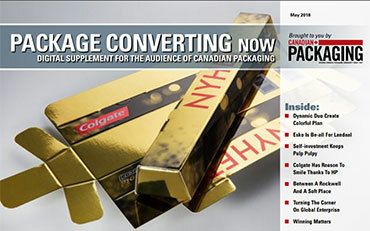 “Different materials and different resins will accept different amounts of these additives and must therefore be expertly formulated and manufactured to achieve success in the field,” Canacas says. “It’s critical to consider the big picture, the total system. At Quadrant, we develop materials to solve or prevent issues, so while a material might perform well on paper, we also go to the next step of field-testing it to ensure, let’s say, that there is no crystallization, which can result in brittleness and cause premature component fatigue. Says Canacas: “It is vitally important for Quadrant to understand the markets to which it is selling its product, and the food business is definitely a high-growth market for us. Adds Swift: “The challenge for Qaudrant is to produce a product that can be detected to avoid complaints from customers about plastic contamination of their food product. “Hence they have to add special chemical component to the plastic so that the radiation embedded in the product inspection systems can detect it. 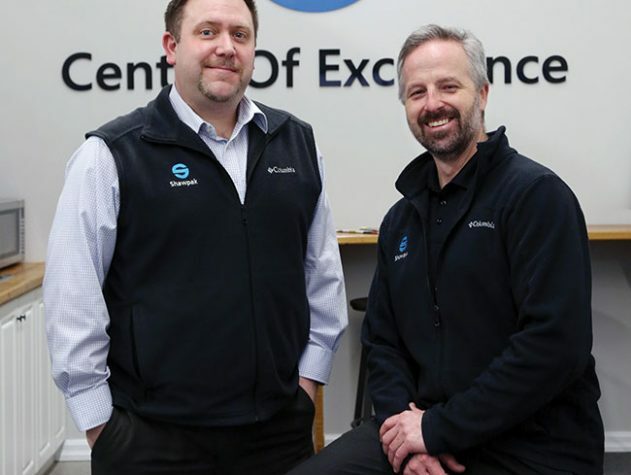 “As a rule, plastics are very hard to detect because they don’t have the conductive characteristics to enable reliable and repeatable detection,” Swift says, adding he is proud to count Quadrant as the Center of Excellence’s first full-fledged training client. As Canacas concurs, the feeling is mutual. “It was tremendous to see the complexity and continual advancement of the technology,” he states. “All the variations involved lead to a better understanding in how we can best knowledge share to further optimize the detectability of the materials, adapting to the unique processing requirements, different food densities and so on. “It was a tremendous eye-opener for me to see the complexity of the technology and all the variations involved in understanding how we can make the materials detectable, and how they behave differently with the different kinds of food, different densities and so on. 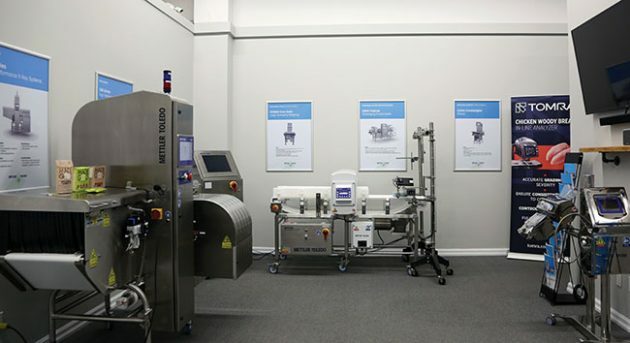 The 2,200-square-foot Centre of Excellence training and demo facility recently opened by Shawpak Systems in Oakville houses a comprehensive range of METTLER TOLEDO product inspection equipment like metal detectors, X-Ray systems, checkweighers and vision systems. In fact, Canacas says he has already enrolled himself to attend a more detailed and advanced training session at METTLER TOLEDO Product Inspection’s international headquarters in Tampa Bay, Fla., this year to expand his knowledge of product inspection further. “Knowledge is eternal,” he quips, “and I’m eager to take this partnership to the next level. “A superior understanding of the science of material detection in the food industry is what will continue to keep Quadrant customers optimized, protected and up and running,” Canacas states. Naturally, such ringing endorsement is music to the ears of Swift, who takes immense pride in being able to complement Shawapak Systems’ vast technical experience to its client base with state-of-the-art METTLER TOLEDO inspection systems, backed up by extensive coast-to-coast technical support offered by the Mississauga, Ont.-headquartered METTLER TOLEDO Canada Inc.
Says Swift: “With food safety initiatives increasingly being strengthened by governments through regulations such as Safe Food for Canadians Regulations and the FSMA (Food Suppliers Modernization Act), it is critical that food production facilities take complete ownership of their product inspection systems. “But having a machine in place is only one part of the puzzle,” Swift concludes.